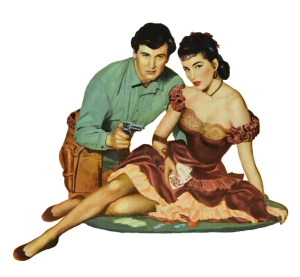 Rock Hudson in his first significant starring role plays John Wesley Hardin, a misunderstood young man with strong interests in guns, gambling and horse racing; he’s also a killer and eventually a family man. His story is told in flashback after his release from prison. Initially young Hardin is oppressed by his preacher-father, played by John McIntire looking like John Brown. McIntire in a second role also plays Hardin’s more understanding (and less religious) rancher-uncle John Clements. Mary Castle is Jane Brown, Hardin’s foster sister and fiancée (until she gets shot). This is a very melodramatic, sympathetic and not terribly factual look at the sociopathic killer. 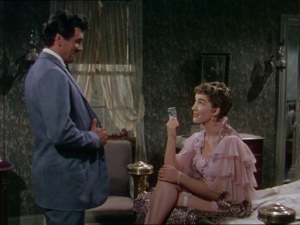 Hardin claims “I never killed any one who didn’t try to kill me first.” Julia Adams as his saloon-girl wife Rosie is lovely as always. 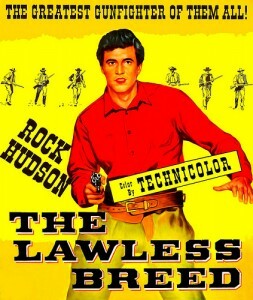 In this account, Hardin is hounded into killing by the brothers of his initial victim (Michael Ansara; the brothers are played by Hugh O’Brian, Glenn Strange and Lee Van Cleef). In the end, Hardin is released from prison in Huntsville after serving 16 years, shakes hands with the warden in unlikely fashion, and goes home to Alabama, where he finds his 16-year-old son (Race Gentry) has taken up a gun and is about to get himself in a fight in a saloon. He breaks up the fight, gets shot in the back and goes home to live happily ever after. Apparently he died on the saloon floor in the original ending, but audiences didn’t like it. Hardin (Rock Hudson) with doomed fiancee Jane Brown (Mary Castle); a grieving Hardin takes up with saloon girl and eventual wife Rosie (Julia Adams). In this, young Hudson is kind of a wooden actor. This was the first of three films director Raoul Walsh made with Hudson in 1953, along with swashbuckler Sea Devils and 3D western Gun Fury. In color. Note character actor Francis Ford, brother of director John Ford, as a saloon sweeper. 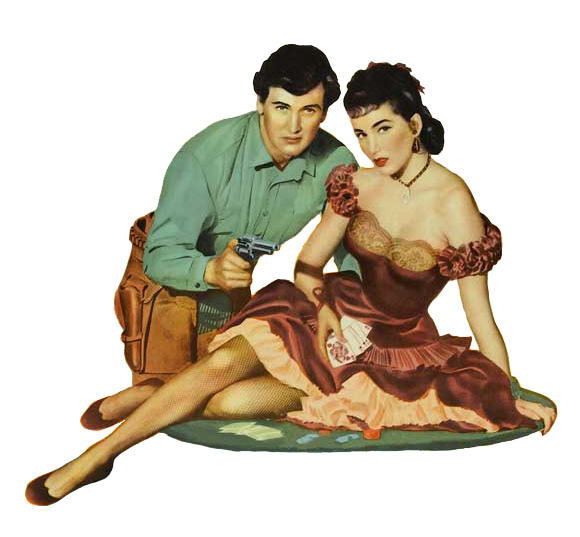 This version of Hardin’s life is an obvious attempt to white-wash one of the west’s nastiest gunfighters. In real life, the ill-tempered Hardin was no family man, may have killed as many as 43 men (by his claim), practiced law (sort of) when he got out of jail, and drifted to a saloon in El Paso, where he was shot in the back of the head by John Selman the year after he was released. He did, however, write down his version of his life, upon which this movie claims to be based. If you want to read about the real Hardin, check out Leon C. Metz’ John Wesley Hardin: Dark Angel of Texas (1998). 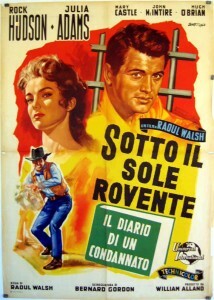 This entry was posted in More Westerns and tagged John Wesley Hardin, Raoul Walsh, Rock Hudson on June 7, 2014 by Nicholas Chennault.